Fly assortments are handy things for fly fishing. By purchasing their flies in a fly assortment (instead of individually), an angler usually receives the most popular flies for many fishing conditions. And, as an added bonus, the angler often receives a free fly box, too. What's not to like, right? A trout fly assortment from Amazon. Comes in a nice fly box, too. Plenty, I'm afraid. Don't get me wrong. I like fly assortments. I have purchased them previously. But some of those purchases have come "with regrets" I'm afraid to say. In short, there's nothing wrong with the whole "concept" of a fly assortment, whether it be for trout fishing, bass fishing or salmon fishing. But "concept" often proves problematic when it comes to execution in the mysterious world of fly assortments. Because of this, I've created this page to help anglers, particularly new anglers, determine whether or not they should buy a fly assortment. And if so, what kind should they get. Do You Really Need a Fly Assortment? When a new angler or a budding intermediate angler starts procuring gear, fly assortments look so tempting. After all, here's a nice fly box full of various flies. The flies in the assortment are priced in ways to be cheaper than if you bought the flies separately. Plus, hey, you get the free fly box, too (assuming, of course, that the assortment comes with the box). And, I suspect, many new and budding intermediate anglers do exactly what I did when I first started to fly fish. That is, whip out the credit card and buy the fly assortment that seems to offer the "best value for the money" - which is another way of saying "The Most Flies for the Fewest Dollars." If that's you....STOP. Give the wallet to your spouse or dog. Then read the rest of this article before doing anything that has potential to provide a mild-case of buyers remorse, at a minimum. Fly assortments, while hardly evil creations, aren't for everyone. Worse, all too often fly assortments lead an angler to spend more money on their flies than if they just purchased the flies the angler needed separately. Now, this isn't saying fly assortments don't have their uses. They do. Fly assortments are perfect for kids chasing panfish. Or new anglers who will be fishing for smaller, half-starved trout in an alpine lake. In short, if the fish are easy to catch, a fly assortment might very well be an ok investment. But for anglers fishing for spooky wild trout, fly assortments often fail in their duty to provide both the needed flies and to save an angler money. Fly assortments have their positive uses. That's the good. Fly assortments have real potential to waste money. That's the bad. Fly assortments might lead to a disastrous and expensive day of fly fishing. That's the ugly. So what is a good fly assortment? Look at the image below, which is an image of a bass popper assortment packaged together and sold by Cabela's. Here's an example of a great fly assortment. This one is a popper assortment from Cabela's. See more Cabela's Fly Assortments. For those not familiar with them, poppers are mainly used for panfish and bass fishing. The squiggly legs and varied colors rarely fail to pull gullible panfish up from whatever seaweed bunker they inhabit. As for bass, the "popping" sound made by the popper as it is jerked back towards the angler often provokes an angry and powerful strike from an annoyed and hungry largemouth bass. Since the above picture is for a bass popper assortment, the poppers are significantly larger than what is used for panfish. But...and here's why this assortment is so nice. The poppers work on any lake or pond. They will attract fish anytime the fish are feeding. And the assortment is "perfect" in size. An angler who purchases this assortment receives a nice selection of poppers, but not so many that the angler "pops" when they walk around the lake's shoreline or needs to buy multiple boxes to hold them all. In short, a "good" fly assortment is one where the flies in the assortment have a wide variety of uses and isn't so large in size that an angler ends up drowning in their own flies. Or to put it more bluntly, a "good" fly assortment is one where the angler has a high probability of using most or all of the flies that come with the assortment. And in this case, any bass angler certainly will find uses for any of the poppers that are part of this assortment. Are there good trout fly assortments similar to this bass popper set? Absolutely. Cabela's in particular is overflowing with smaller, "trout fly assortments" that are designed for specific uses, and usually contain 10-20 flies or so. So what's a bad trout assortment? It is an assortment that, quite simply, contains not enough of the flies an angler needs; while containing too many flies an angler will never need. Not surprisingly, this problem arises with larger fly assortments - between 25-50+ or so flies. The primary problem with these assortments is that they are like a "buffet." Similar to a buffet, there's lots of flies in these larger assortments that will simply sit in an anglers fly box, doing nothing more than taking up space. Meanwhile, the assortment will lack the depth of sizes of particularly important flies. For example, most large fly trout fly assortments come with 1-3 Parachute Adams, a popular and potent trout fly for Montana waters. The problem is that instead of providing "depth" of that particular fly (such as multiple Parachute Adams in multiple sizes), the assortment only contains 1-2 flies in a "popular" size, such as size #12. The result, of course, is that as soon as an angler discovers they need more Parachute Adams flies, they have to go out and purchase them separately. Meanwhile, many of the other flies in the fly assortment just sit there gathering dust. The final result of this is that an angler ends up spending more money on flies then they would have otherwise, and have cluttered up their fly box with flies they likely will never need. Spending extra money on flies won't kill most anglers. However, if an angler does it too often there's the real potential for ugly things to happen. 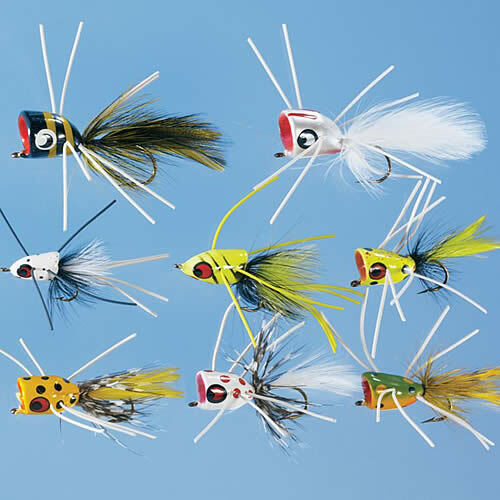 The ugly fly assortment, or in particular assortments since anglers often purchase several of them, is where the angler has far too many flies...yet none of them are the right ones for the water they are fishing. An Ugly Fly Assortment. Contains over 100 flies. 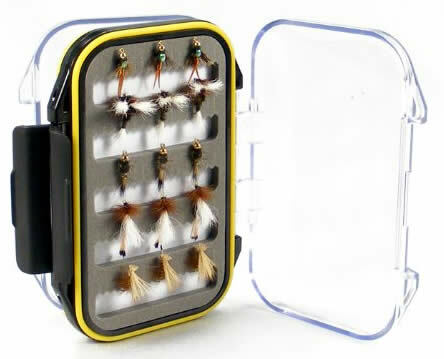 Nice fly box and flies are good quality. But new anglers will be very limited by the depth of flies. A fly selection like this is "broad, not deep." Very few anglers will ever use more than half the flies in this assortment. Even uglier, and which is a problem peculiar to new and budding intermediate anglers, is where the angler has so many flies they can't identify them or understand what a particular fly is used for. In short, the angler is literally "drowning in flies," while lacking the knowledge of what to do with them. It's an ugly situation for new anglers and one that can destroy a day of otherwise productive fly fishing. New anglers often think they need a "ton" of flies to get started trout fishing. This is false. Indeed, it is worse then false. It is bad advice, period. Instead, new anglers should, before buying any flies, first determine where they are going to fish and what time of year they are going to do it. Then, and only then, should they start purchasing flies based on whatever knowledge they have about what the trout feed on in that particular river at that particular time of year. For example, let's take Rock Creek here in Montana. It's a fantastic trout fishery. And much of the year it is top-water heaven. Yet an angler who purchases a multitude of fly assortments, stuffs them all in their vest, and heads out to Rock Creek in April will watch in helpless furor as the trout gorge on a fly that is rarely part of any fly assortment, the salmon fly. I can go on and on about having the wrong flies for the wrong river at the wrong time of the year, but hopefully you get the point. Larger fly assortments are, by and large, more trouble then they are worth. Huge assortments contain too many flies for new anglers, and never contain enough of the actual flies that anglers need for the type of fishing they are doing. And just as bad, for new anglers all those flies likely will be difficult to identify and to use properly. And there's also the storage problem, too. Buy small fly assortments where the odds are good you'll have use for most or all of the flies. Better to buy an assortment of one fly in multiple sizes then it is to buy an assortment of dozens of flies in just a handful of sizes. Large fly assortments are like buffets. They look pretty but have little practical use for new anglers. Before buying any fly assortment, know what you'll be fishing for and where/when you'll be doing it. Fly assortments can be fine for some anglers and awful investments for other anglers. It all depends on what are you fishing for...and when. 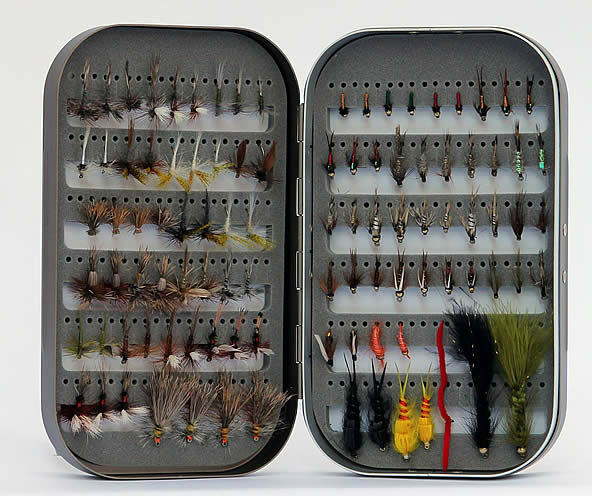 Don't buy a fly assortment just because it comes in a pretty fly box. In general, it is better to have fewer types of flies in multiple sizes, than it is to have a bucket full of different types of flies but in limited sizes. If you do buy a fly assortment, be absolutely sure you know what each fly in the assortment is called and what it is used for. Offline, any retailer that sells fly fishing equipment will, somewhere in their store, have a few fly selections lying around. As a general rule, the "better the store" the better will be the flies in the assortment. For this reason, the best place to buy fly assortments is at respected local fly shops and major retailers like Cabela's. Online, anglers have many choices. Cabela's - Cabela's has a huge selection of fly assortments. I'm not wild about their larger ones (too many flies and not enough depth of sizes), but most of their assortments are small enough to be useful. Most also come with a small plastic foam fly box, too. Amazon - Amazon likely has the largest variety of fly assortments. Just beware that many assortments on Amazon are huge, sometimes containing 100 or more flies. I suggest anglers pass on those and focus their attention on smaller assortments.